Green flag, Sauter gets the jump on the inside. Freisen and Gragson runs side by side into turn one for 2nd. Freisen wins that battle on the bottom. He pulls to the bumper of the leader in a hurry. Lap 2, Sauter bottoms out in the middle of turns 1-2. He skates up the banking. Friesen drives right by on the inside. Sauter is still chasing the truck, two more slip by. Lap 3, Bo LeMastus is around in turn three. The caution is out. Green, They run near even into turn one for the lead. Haley has a look on the inside. He backs out. Sauter skates up the hill and loses several more positions. Haley has a run off turn two. Haley and Gragson spilt Friesen. Gragson and Haley run side by side, Haley wins the battle on the bottom. Lap 9, Sauter heads to the pit lane. He’s got a flat tire after starting on the pole. Lap 13, David Gilliland is making a charge to the front. He’s up to 2nd. Lap 14, Gilliland is in the wall! He just ran out of room off turn two. He might have had a flat tire as the car just pushed up the track. He heads to the garage with the window net down. Green, Haley leads into turn one. Gragson can’t get to the bottom. Codie Rohrbaugh is around in front of the field! He slides backwards up the banking. Sauter gets tagged from behind while trying to avoid it, light damage. Several cars head for the pit lane. Green, Haley and Sheldon Creed run even into turn one. Creed pinches him down. They bang fenders coming back to the line, Haley wiggles. Haley drives it deep into turn one, he confirms the lead. 10 to go in stage 1, Ben Rhodes is up to 7th. He started at the tail after tagging the wall in qualifying and making repairs ahead of the race. Creed fights back in turn one. He takes the lead on the bottom. 7 to go, Haley has a run into turn one. He pulls to the inside at the last second, dive bomb. Creed leaves half a lane open, that sacrifices the corner exit speed. Haley has a run on the bottom out of turn two. Haley leads into turn three. 4 to go, Codie Rohrbaugh is around again. The caution is out. Jordan Jordan Anderson is off the track with the hood up. This stage will finish under yellow. Justin Haley takes the win in stage 1 at Texas Motor Speedway! That’s the first stage win of his NCWTS career. The field heads to the pit lane. Haley is first in but he’s off in 5th. Chastain took fuel only. He was the only truck to do that. Everyone else took two tires. Friesen is off 2nd. Creed had to backup in his pit box. Chastain returns to the pit lane. Six cars stayed out. Green, Snider gets the jump on Jesse Little. Big crash! They went three wide and ran out of room. Sauter and Gragson bang doors. Sauter collects a bit more damage on his machine. Green, Snider gets the jump on Little. Harrison Burton follows him through and takes over 2nd. 10 to go in stage 1, Snider continues to lead. The top six trucks run nose to tail around the bottom. Haley is up to 2nd. As Haley looks under Burton it killed the momentum and Burton got hung out to dry on the outside lane, he falls to 7th. Lap 60, Sheldon Creed is around. The caution is out. He spun in turn two while running 11th and tagged the outside wall with the rear deck lid. Several trucks head for pit road. Burton, Friesen, Sauter and more. Green, Snider gets the jump on Haley. Snider is on the same tires that he started the race with. Austin Hill and Haley run door to door for 2nd. Crafton had a run on both of them, Hill throws an aggressive block into turn three. 4 to go, the caution is out for debris. Creed made many repairs on pit road. The tape didn’t hold and body pieces went flying on the race track. This one will finish under yellow. 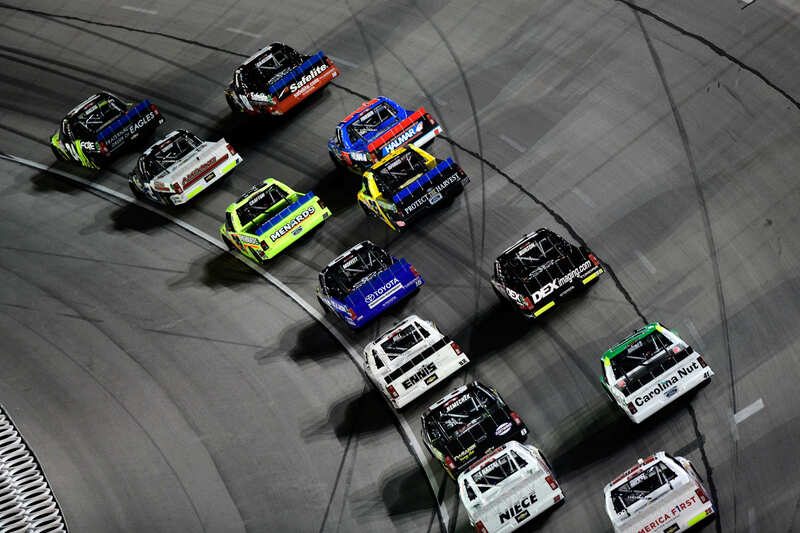 Myatt Snider wins stage two of the NASCAR Truck race at Texas! That’s the first stage win of his career. The field heads to the pit lane. Rhodes and Joe Nemechek are off first with a fuel only call. Snider is the first truck to the pit exit with four tires, he’s off in 6th. Crafton gets pinned in his box. Several trucks stayed out. Green, Todd Gilliland leads Friesen into turn one. They open up a gap of ten car lengths to 3rd. Lap 108, Friesen has a run off turn two. He been on his bumper for the last 30 laps. Gilliland pinches him on the entry to turn three. That takes the air off the spoiler of Friesen as he gets sideways into the corner. Sideways and on the gas, Friesen leads off turn four. Lap 115, Friesen heads to the pit lane for a green flag pit stop. Gilliland and Sauter follow him. Friesen is too fast entering! He’ll have to serve a pass through penalty. Lap 125, the pit stop cycle is complete. Todd Gilliland leads Justin Haley by 4.5 seconds. 6 to go, Todd Gilliland leads Haley by 2.7 seconds. Haley is chipping away at the lead. But, at this rate he’s going to run out of time. 2 to go, Gilliland leads Haley by 2.1 seconds. 1 to go, Gilliland is slow off turn two! The car is sputtering! Justin Haley cruises right on by! 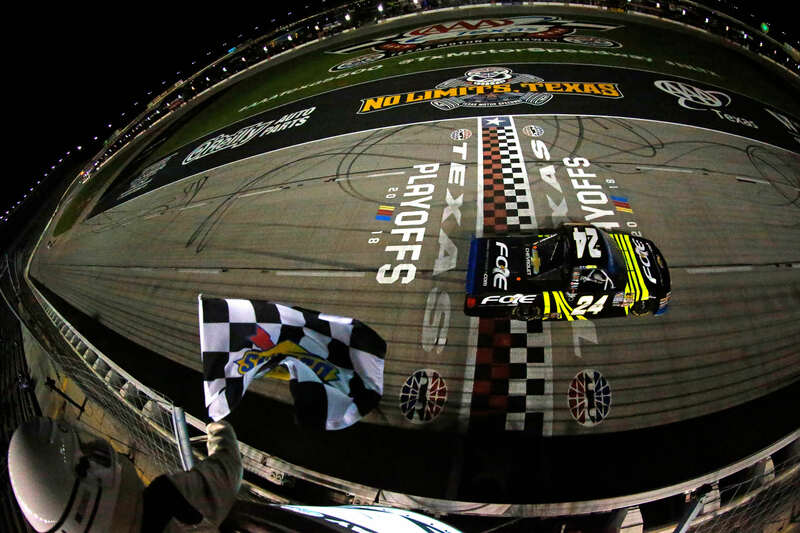 Justin Haley wins the NASCAR truck race at Texas! Wow! 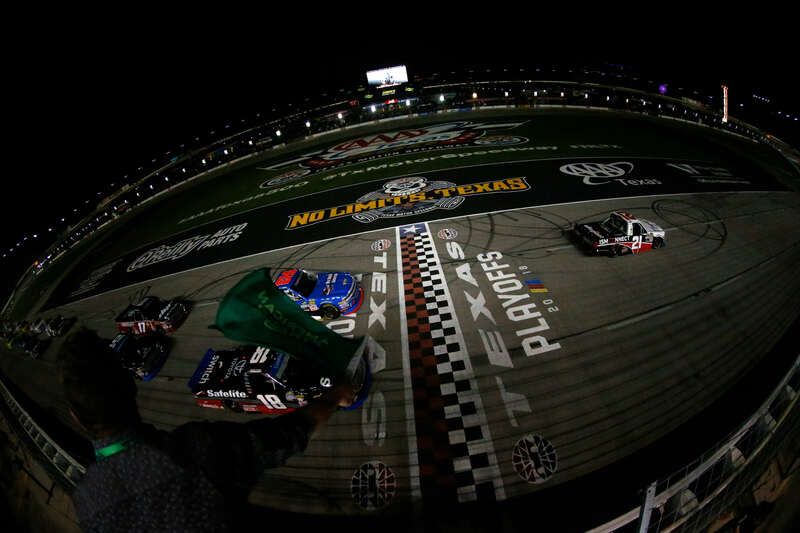 Below, you can view full Texas Motor Speedway results from the NASCAR Truck Series race on November 2nd, 2018.